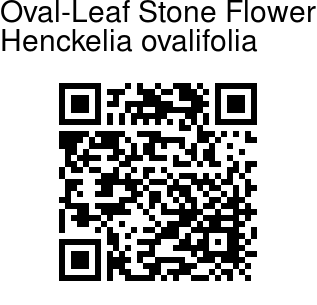 Oval-Leaf Stone Flower is a stemless herb with leaves ovate rounded toothed white-bristly on both surfaces. 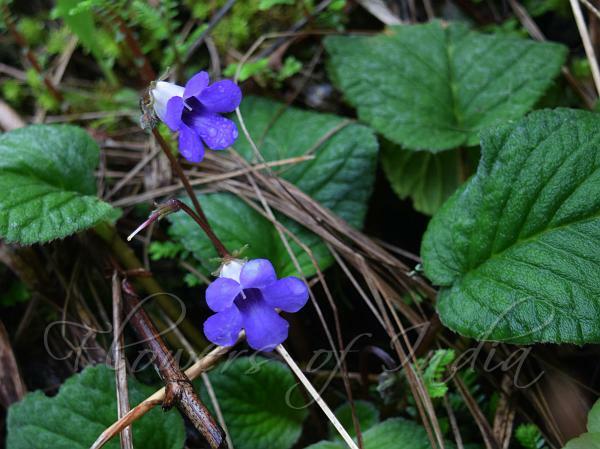 Flower-cluster-stalks are 3-5-flowered, flowers broadly bell-shaped swollen, base pouch-like. Flower-cluster-stalks are about 8 cm, sepals 4 mm. Flowers are 1.2-1.6 cm, blue-yellow, nearly hairless. Filaments are short, anthers hairless. Ovary is hairy, style about as long as the ovary, nearly hairless, stigma small somewhat head-like. Leaves are 7-8 x 3.5-4 cm, blunt, base rounded, shallowly rounded toothed, above densely bristly, beneath chiefly on the nerves. Nerves are 8-12 pairs, parallel. Leaf-stalks are long, 2.5-10 cm. Capsules are linear, straight or somewhat oblique at the base. Oval-Leaf Stone Flower is found in S. Deccan Peninsula, at altitudes of 1600 m.